Hmmm.... 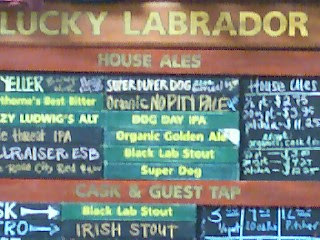 Recently I was wishing for the return of a couple of Lucky Labrador IPAs: Triple Threat, and Super Duper Dog. Then Lee chimed in with a comment about how good the Old Yeller Barleywine was when he visited last summer. Today I went in there to find that Old Yeller and Triple Threat are on tap, and Super Duper Dog is for sale in 22 oz. bottles! Hooray! My wishes have been granted. Also, my earlier entry sold them short on the number of taps; the board here clearly lists 11 house ales on tap, plus, cask, nitro, and guest taps. Super Duper Dog is only in bottles right now, but the flyer for it at the bar mentions it being on tap for a short time. Maybe that's at one of the other locations -- no one knew about it on Hawthorne today.